Samsung has just launched the Chromebook 2 Series with two models based on on Exynos 5 Octa SoC, available in 11.6″ (1366×768) and 13.3″ (1920×1080) configurations, and featuring 4GB RAM, 16GB eMMC, and a longer battery life thanks partially to big.LITTLE processing technology. 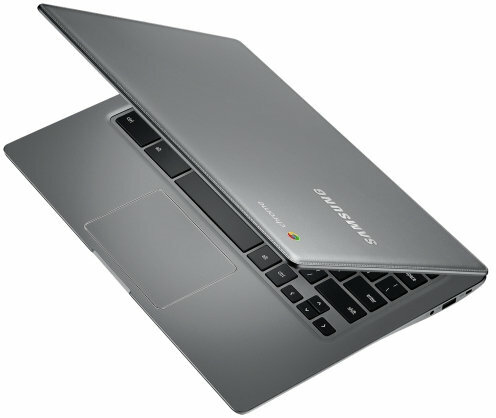 Samsung expects the new Chromebooks to be used for work, education, and entertainment. Thanks to strong hardware specifications, these new ARM based Chromebooks will certainly offer performance similar to, or even outperforming, existing many Intel Celeron based Chromebooks, and at the same time offer a longer battery life. It’s a nice upgrade to the Exynos 5250 powered Chromebook launched in 2012, especially the addition of a model with a 13.3″ display with FHD resolution. The 13.3″ model has an Exynos 5 Octa processor clocked at 2.1GHz which should be the latest Exynos 5422, whereas the 11.6″ model might use Exynos 5420 instead (TBC). The company also mention the 13.3″ Chromebook 2 features high-power stereo speakers (2Wx2) and a noise reducing array microphone optimized for Google+ Hangouts messaging and video calling. Thanks to Chrome OS, the laptops will boot within seconds, be updated automatically, and all information and files are saved, and encrypted to your account. Some premium adds such as Air Droid Premium, Wunderlist Pro, and LittleBridge.com will be included with the device. 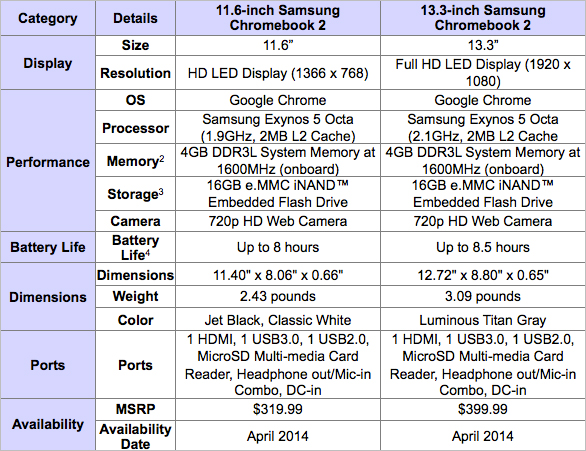 The 11″ and 13.3″ Chromebook 2 will be available (in the US) in April 2014 for respectively $319.99 and $399.99. i think its too much for something thats going to run a browser. Does this Soc encode in VP8 ? I guess it needs to be hangout certified ? So people are running Ubuntu on the Chromebook Exynos 5250, so it’s likely Ubuntu will be ported to the new Chromebooks by the community. AFAIK, Samsung did not say anything about this, but Exynos 5260 VPU can encode and decode VP8, so it’s fair to assume 5422 can do this too. I don’t really know. But Chrome OS is Linux, so I thought Ubuntu would work too without too much hassle. Maybe I’m wrong here. ARM 64-bit SoCs will come for server first. Hardware platforms are more or less available, but obviously difficult to get because they are expensive and/or they don’t sell to individuals. Mobile SoC with Android will come later, maybe by the end of the year, at least that’s my feeling after listening to Linaro opening keynote yesterday. What community is that? That supposed community that’s behind the arm chromebook? I spend a few minutes talking about the lack thereof in my Lima talk at fosdem, you can find the link to that from the last post in my blog. There’s not really an active developer’s community, but I’ve seen people, who happen to be developers, play around in the Linux on ARM community in G+. You may need to scroll down a bit to find interesting bits. I’m writing these lines on original Samsung ARM Chromebook running Ubuntu in chroot (via crouton). I don’t install Ubuntu natively exactly in case I want to do something silly like watch youtube videos in 1080p. Otherwise, makes good work (like, software development) machine. So, new chromebooks definitely should be good enough for linux and cute upgrade overall, though I personally expect decreasing prices and extended global availability, not pumping up tech specs. Correct, but Android has tweaks and the bionic C lib which makes the kernel and drivers not fully compatible with “standard distributions” like Ubuntu or Debian. I thought Chrome OS kernel and driver would be compatible with “standard distributions”, but since people can not play videos on Ubuntu, I guess there must be some key differences.